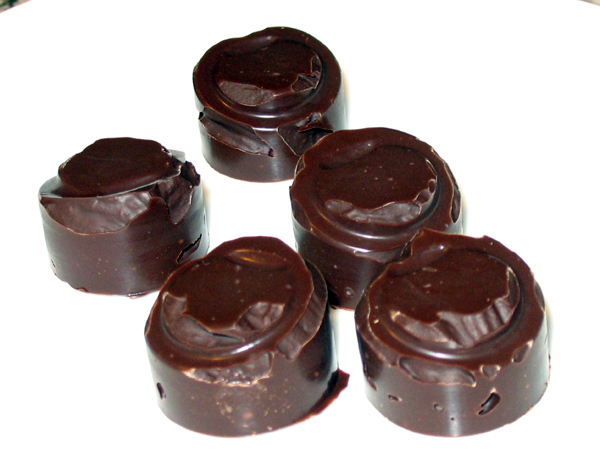 I have made chocolates before, but I have never used a chocolate mould before. I was curious if having a properly shaped and sized chocolate would really make a difference. Taste is the most important factor, and I know that my chocolates taste good. So how important are aesthetics? Let’s find out. Once again I am using Callebaut chocolate which I adore. Make sure that all your kitchen implements are clean and dry to prevent seizing. 1. 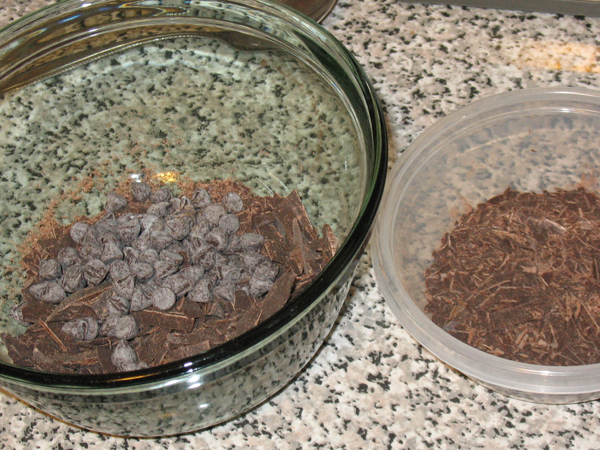 Melt chocolate in the microwave, reserving about one third. Microwave on High for 3 minutes, stirring every 30 seconds. 2. 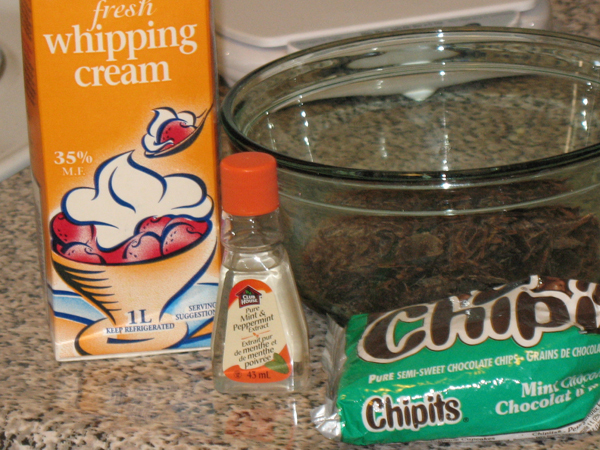 Add reserved chocolate to melted chocolate, and stir in 1 drop peppermint oil. Stir until smooth. 3. In a heavy-bottom sauce pan add cream and 2 drops of peppermint oil, heat to scalding. 4. 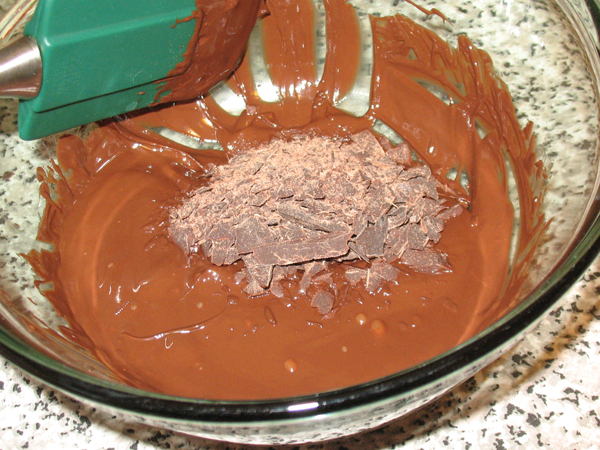 Using a sieve, add cream to chocolate and stir until smooth. 5. Spoon into mould. My chocolate was very thick so “smoosh into mould” might be more accurate. 6. Run a flat-end scraper over the top of the mould. I used my silicone spatula for this, in 3 passes. This action collects the excess chocolate on the end of the scraper, which you can then stuff into any cup that isn’t filled enough. 7. Place mould into covered container, and chill. The product description says chill 20 min but I let them chill for 3 hours before sampling, and the were perfect, and I left the rest in the fridge overnight anyway. 8. To remove from mould, cover your hand with a plastic baggy and use thumb to pop out the chocolates. 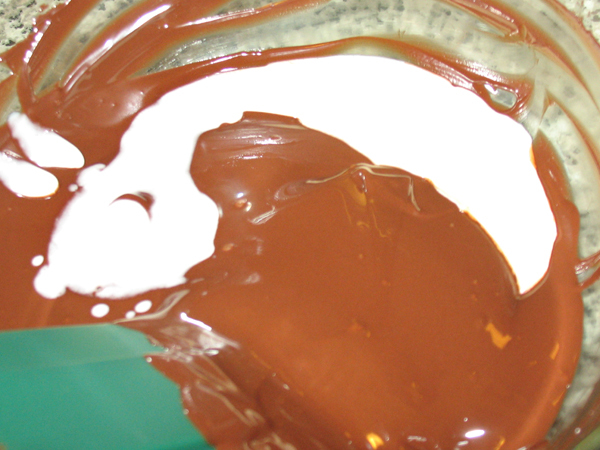 The plastic prevents the oils on your skin from blemishing the chocolates. Work quickly and touch the pieces as little as possible to avoid melting and smudges. Verdict: These turned out great, I’m quite pleased. They are smooth, creamy, and make my taste buds sing. Oh, I love peppermint! Using a chocolate mould was easy. 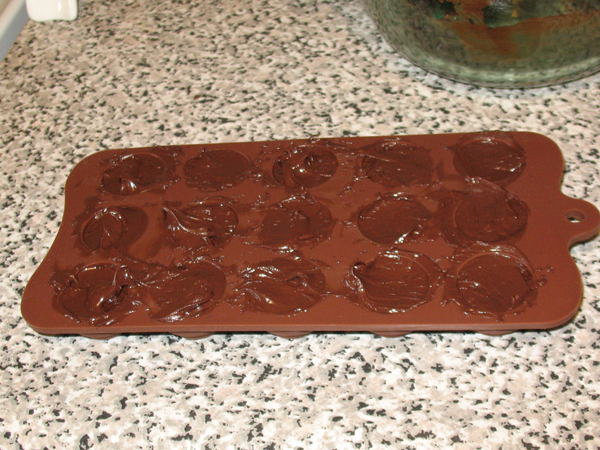 If you want to make a large amount of chocolates, use 4 moulds at a time and quadruple the amounts of chocolate. This mould cost $8.25 and was totally worth it. 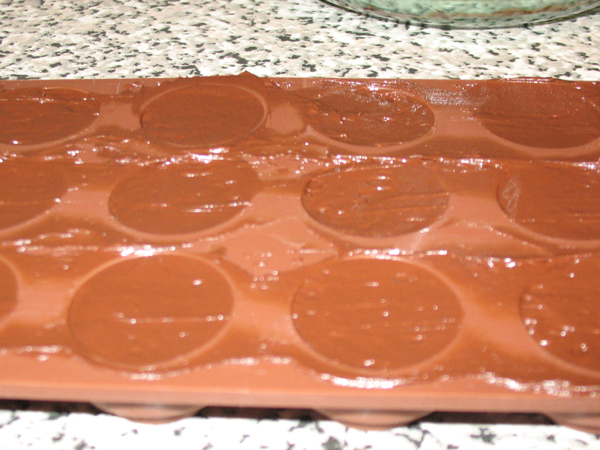 I knew my chocolate would have air bubbles because it was so thick, there was no way to ensure it flowed into the moulds evenly. If you are looking for a perfectly smooth finished product, skip the cream. 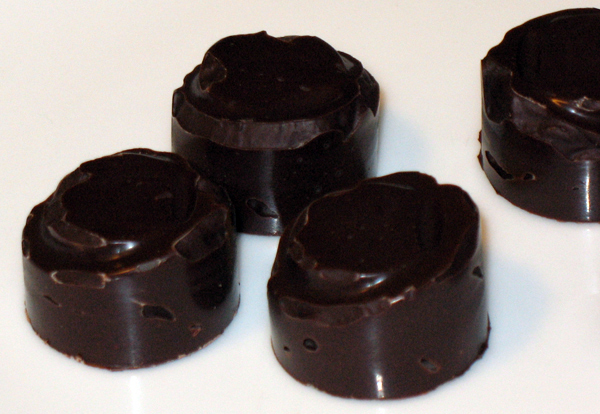 I don’t regret any of the chocolates I made in muffin tin cups, but from now on I will always use a mould. Making these has changed me profoundly. I’m completely serious. It feels like I have reached a whole new level in baking. I feel like a rock star. It reminds me of the day I made the dessert that changed my life, but more on that in December. Have you ever baked something that made you feel differently about your mad skills?